One of our top ten best selling beers in the store! The verdict: I’d say we’re surprised, but honestly, we’re not. 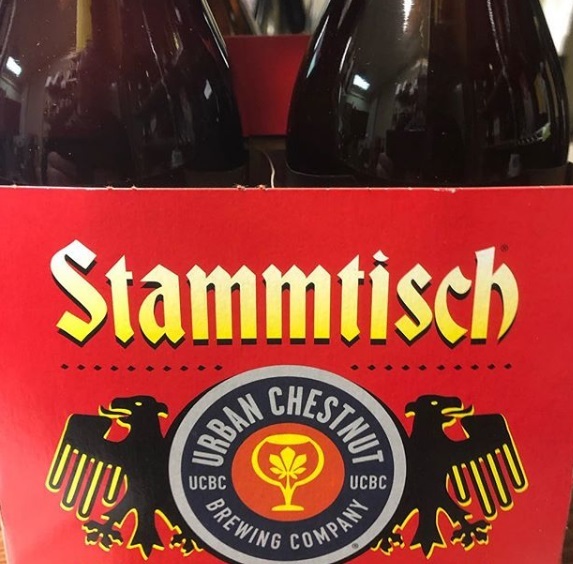 Urban Chestnut, who we just wrote about as Missouri’s most underrated brewery, simply makes superlative German beer styles, and there’s no denying it. Whether it’s a hefeweizen or zwickelbier or pilsner, they are experts at handling the subtleties of German styles, especially those that are dependent upon malt complexity. What this brewery manages to do on the regular is wring unique flavor out of ingredients that literally everyone uses. What are they doing to get this kind of perfectly balanced bready, grainy flavor profile out of simple pilsner malt? I have no idea, but there’s a degree of malt complexity in most of their German beer styles that makes those beers pop. In Stammtisch, that maltiness is balanced by wonderfully floral, perfumey, evocative hops that dominate the nose before slowly ceding to malt on the palate. It’s an extremely clean, crisp German pilsner that strikes the ideal balance between drinkability and character—a hoppy beer that would never overwhelm the palate of a hop-averse drinker, and provides a little bit of something for everyone. It’s just a delicious pilsner.